Kiwae Hokama, 91 of Lanai City, passed away on June 18, 2018 at Maui Memorial Medical Center. She was born on Kauai on February 10, 1927. 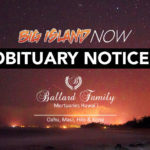 Memorial services will be held at 4 p.m. on Monday, July 9, 2018 at Ballard Family Mortuary with visitation starting at 3 p.m. Kiwae retired from First Hawaiian Bank where she worked as a bank teller. She is survived by her son, Riki Hokama; daughter, Joy (Barry) Helle; sisters, Chiyoko Hashimoto and Doreen Inazu both of Kauai; grandchildren, Jordan and Trent Helle; and great-grandson, Kasen Helle. Kiwae is predeceased by her husband, Goro Hokama. Alice Prito, 89, of Haiku, passed away on June 25, 2018 at her residence. She was born on November 12, 1928 in Makawao, Maui. Visitation will be held from 8 a.m. to 11 a.m. on Saturday, July 7, 2018, at Ballard Family Mortuary, prayer at service 11 a.m. and cremation will follow. Alice retired from the County of Maui Parks Department. She is survived by her daughters, Betty Jane Uwekoolani of Wailuku, Enola Gay (Francis) Tavares of Oahu, Alberta (Herbert) Kinores Jr. of Makawao; sons, Augustine F. Hosino Jr. of Texas, Dennis Hosino of L.V., Nevada, John L. (Roxanne) Prito of Haiku; brothers, Albert Ape’ Fernandez of Makawao, Louis Fernandez, Boniface Fernandez of Oahu; sisters, Theresa (Russell) Cain Sr. of Florida, Bernadette Fishmen; 17 grandchildren, 34 Great-grandchildren, 11 great-great-grandchildren; and numerous nieces, nephews, and cousins.